Avengers 4 star Don Cheadle is having a lot of fun teasing fans on social media about the official title. Speculation about the title has been kicked into overdrive in recent weeks, with some pretty convincing fan theories floating around. Annihilation seems to be the most popular title at this point in time, but Cheadle didn't mention it, or anything else too specific, which has certain Marvel Cinematic Universe fans hunting for clues, even though the actor is clearly kidding around. 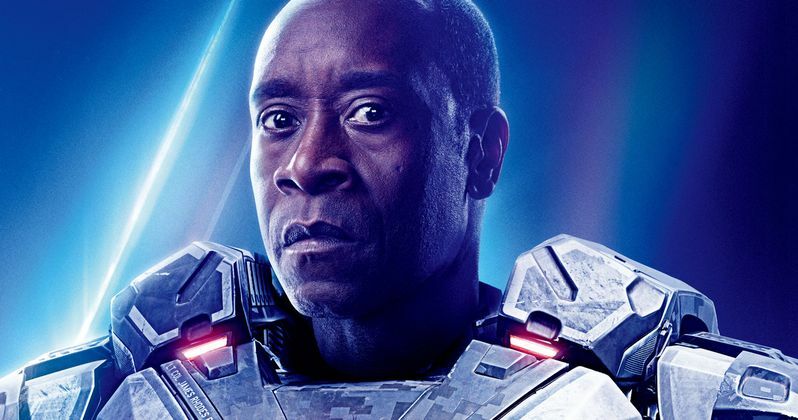 Don Cheadle portrays James "Rhodey" Rhodes, aka War Machine, in the MCU and was asked on social media if he was finished with the Avengers 4 reshoots. As a side not, the Russo Brothers announced that the reshoots had wrapped late Friday night. The MCU fan then asked if the actor could possibly give everybody a hint about the title. Cheadle had this to say. "I shouldn't do this, but because I love you all so much I'll give you a hint. The title will incorporate letters that will be organized in a coherent fashion with the express purpose of communicating to the consumer the content of the film. (I'm (in) so much trouble...)"
So, there we go. Don Cheadle has revealed that the Avengers 4 title will contain words made up from letters. Cheadle's hilarious response has some MCU fans more than a little angry, but it's all in good fun. The actor has a healthy sense of humor, which is evident on his Twitter account, where he is often humorously dealing with trolls while not taking himself too seriously. Cheadle's scenes with Mark Ruffalo in Infinity War were some of the standout moments in the film, so let's hope we see more of that dynamic in Avengers 4. Over the weekend, an Avengers 4 trailer description leaked, but many believe that it's way too good to be true. With that being said, there are some pretty convincing components to it, which has many intrigued to know more. Upon closer inspection, it looks like the description is just a very detailed run down of the leaks that have popped up over the past several months. We'll find out soon enough if it was real or not when the official trailer is released. Avengers 4 doesn't hit theaters until next year, but that hasn't stopped the speculation from running rampant about the title and storyline. If Marvel Studios treats the promotional campaign in a similar fashion to that of Infinity War, we should get the title reveal and teaser trailer by late November or early December. If true, the trailer will have a healthy distance from the Captain Marvel trailer, which premiered a few weeks ago. Hopefully MCU fans have learned not to ask Don Cheadle to reveal Avengers 4 spoilers from here on out. You can check out the humorous title tease below, provided by Don Cheadle's Twitter account.